What exactly is a £5billion (or £5.5billion – obviously the odd £500million doesn’t matter much at the Times) divorce? It’s meaningless in this form. In fact it refers to the couple’s joint fortune, which has been split between them. I would have put in that Ms Ecclestone’s father is the Formula One tycoon Bernie, since presumably he is the main source of her cash. 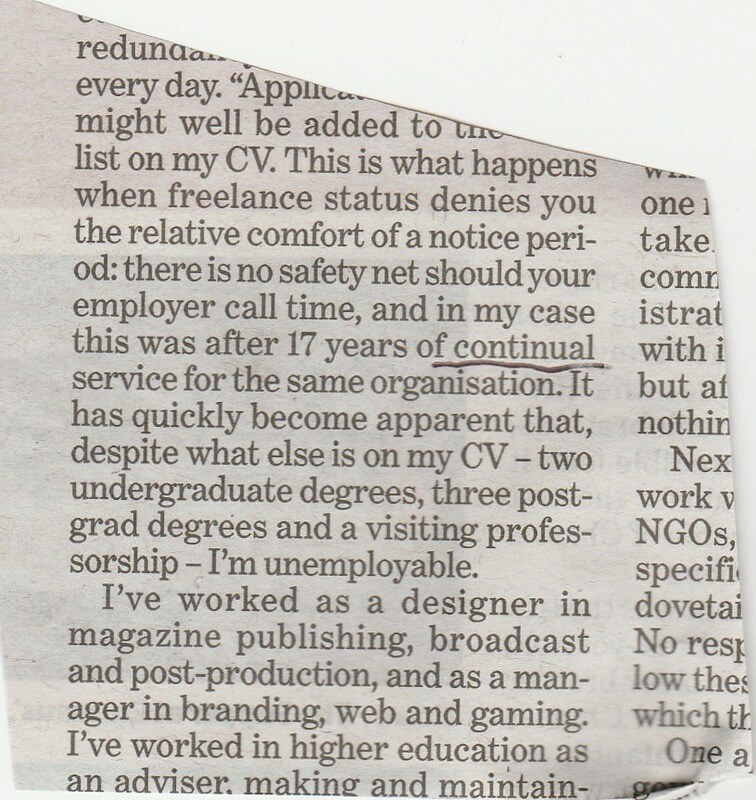 ‘Special’ and ‘specially’ are among the words I most often take out of copy. 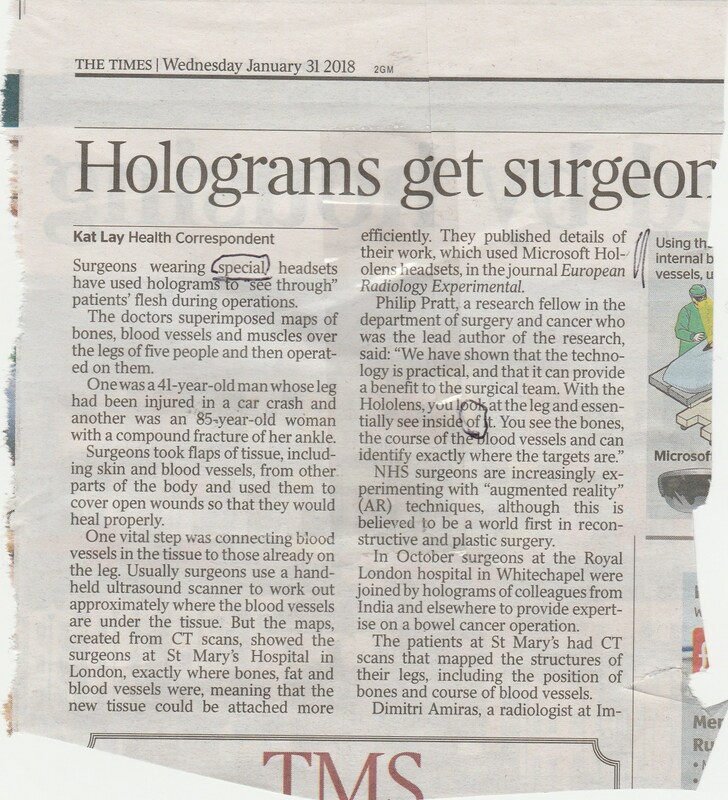 Surely it goes without saying that if surgeons are using headsets they will not be toys or ones designed for metal detecting? Of course they are specific to the task. Another example which often comes up involves ‘specially trained marksmen’ or similar, as if any passer-by might be asked to do a spot of shooting. In the second leg, ‘inside’ does not take ‘of’. It should be ‘see inside it’. The same applies to ‘outside’. This error often shows up as ‘Speaking last night/outside his home, he said . . . ‘ Any time you find yourself writing ‘speaking’, check that it is necessary – it rarely is. This is a commonly seen construction but it is shockingly ignorant. The explanation is quite technical but I will have a go. Continuous verb forms are constructed with the present participle (-ing form), not the past participle (-ed form). So you would write ‘she was knitting a jumper’, not ‘she was knitted a jumper’. 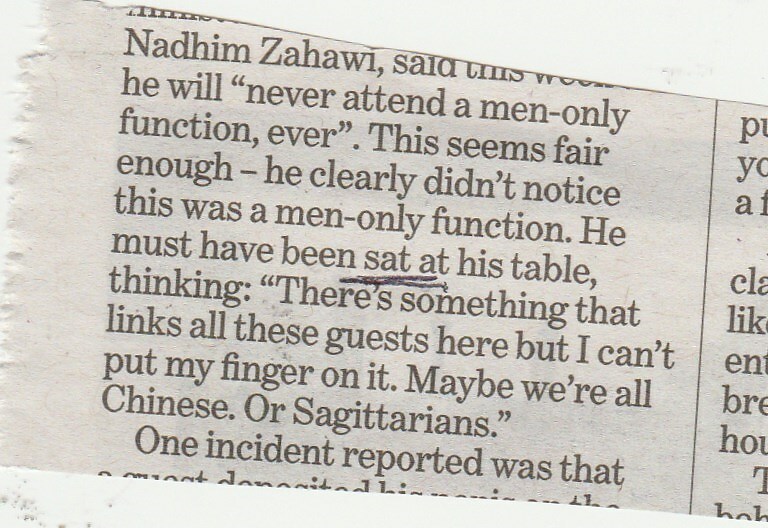 ‘Sit’ is one of the many verbs in which the past participle varies from the ‘-ed’ form (in this case it is ‘sat’), but it is just as bad to put ‘he was sat’ as ‘she was knitted’. 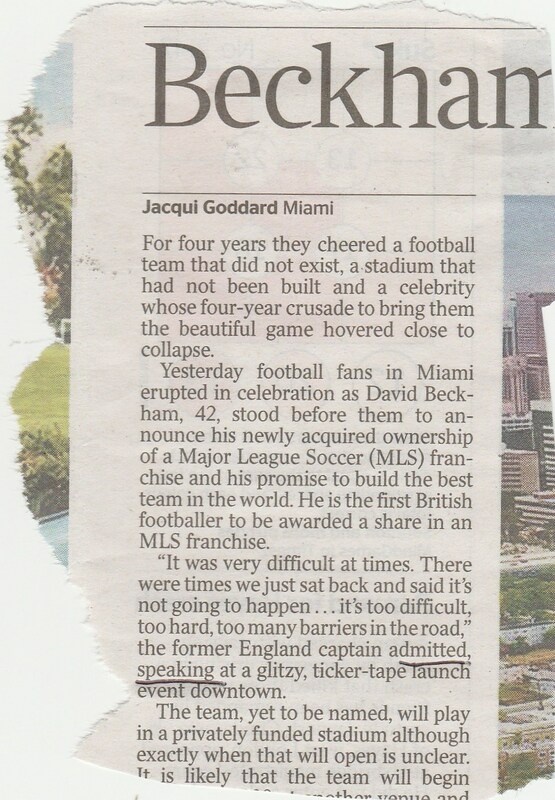 This is from the same piece in the i newspaper. There are different views on whether or not to cap champagne. I feel that you would cap the area but not the drink. So ‘the best fizzy wine comes from Champagne’, but ‘I think champagne is overrated’. 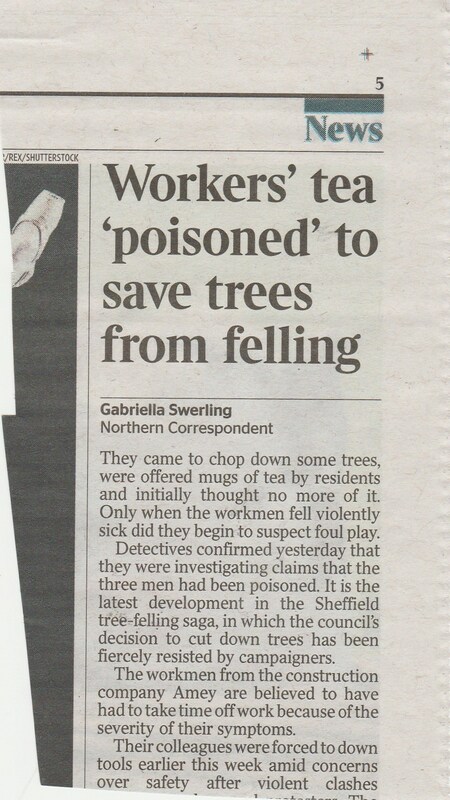 Detectives are investigating claims that workmen sent to cut down street trees at the centre of a dispute were poisoned by mugs of tea offered to them by residents. It is the latest development in the Sheffield tree-felling saga, in which the council’s decision to clear 6,000 trees from the city has been fiercely resisted by campaigners. This is a completely spurious statistic, suggesting that the tortoise moved continuously for six months, which is obvious rubbish. 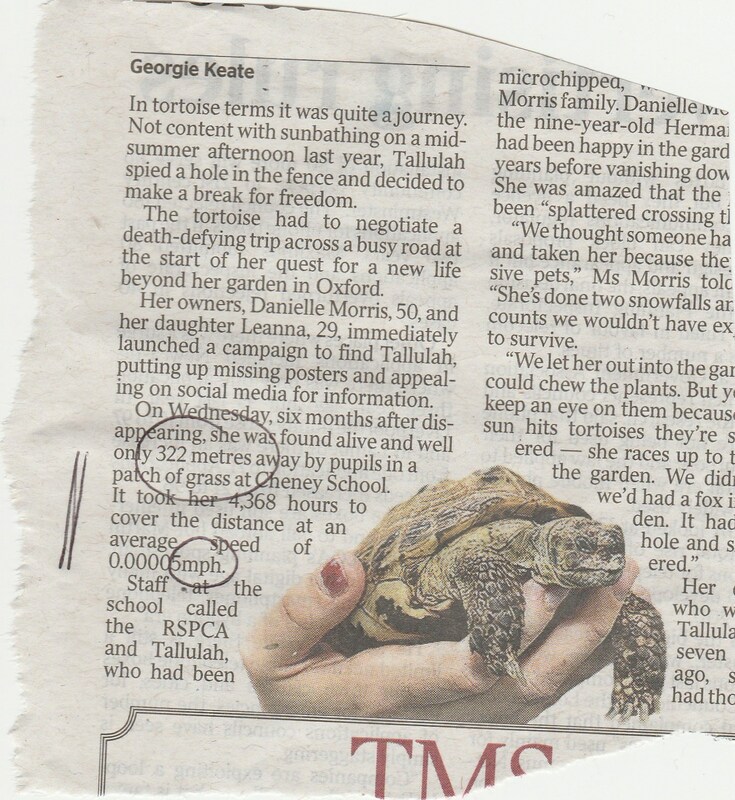 Presumably it is meant to reinforce the popular view that tortoises move extremely slowly (which the second leg of the story makes clear is not true, but I cut it badly). By the same token if someone travels eight miles to work and spends eight hours there, you could say he had done an average speed of one mile an hour. It’s silly. And if you are going to give one set of measurements in metric (322 metres) you have to be consistent and not switch to imperial (miles per hour). A ‘gaffe’ is a social blunder, usually an embarrassing one. The word wanted here is ‘gaff’, an informal or slang word for a person’s home. ‘Strangled’ means ‘killed by compressing the throat’ so ‘to death’ is redundant, not to mention ignorant. Having said that he was strangled, you don’t need to say he was found ‘dead’ at his home. ‘Pet’ appears in the heading, and ‘his’ implies ‘pet’, so you don’t need that. 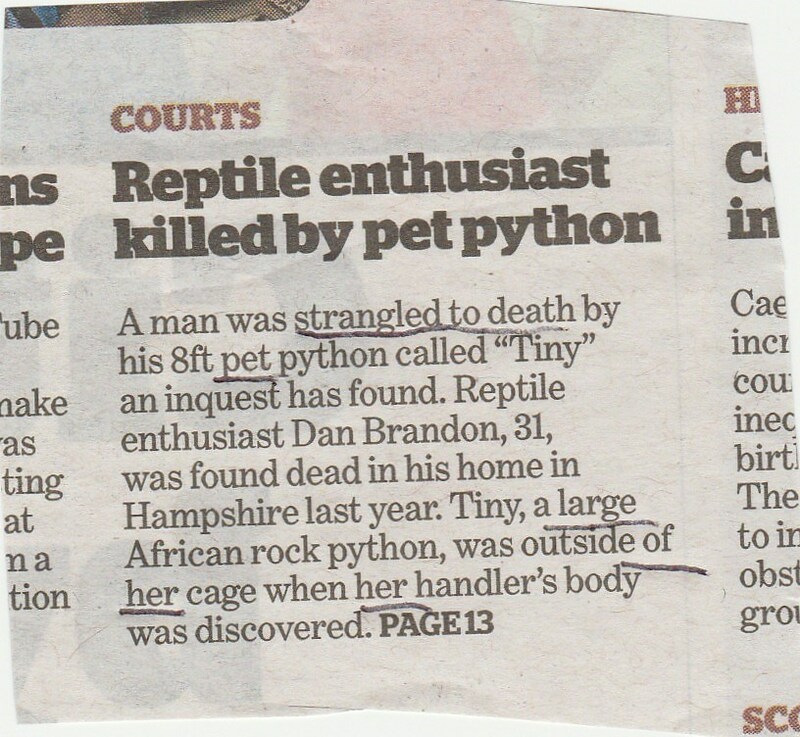 If you give the length of the python, you don’t need ‘large’. Another clear sign of ignorance is ‘outside of’. It’s ‘outside’. By and large, animals should be referred to as ‘it’, not ‘he’ or ‘she’. An exception would be a personal piece about a beloved dog or cat, say, though I hope I never have to read another of those. ‘It was revealed last night’ is one of the most over-used phrases in newspapers, and here the idea of revelation is absurd. 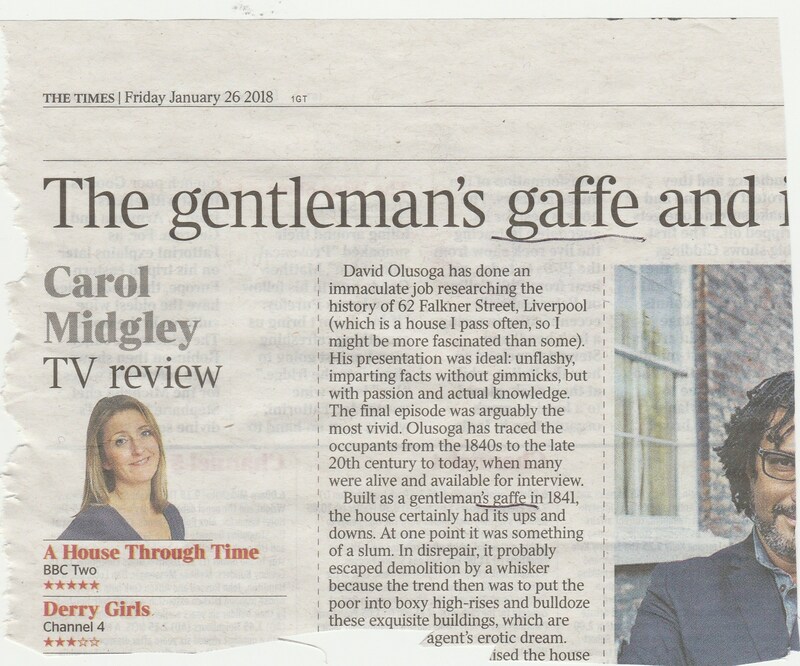 It’s not exactly ‘hold the front page’ material, is it? Instead of squashing initials together, it is much better to put a space between them thus: W E Johns. It’s even better if you know how to do half spaces, which I don’t. Incidentally, the author is always known as Captain W E Johns. ‘Continual’ and ‘continuous’ are not exactly the same and are often confused. ‘Continual’ means to recur at frequent intervals, as in ‘he was driven to violence by the continual barking of the dog next door’; ‘continuous’ means prolonged without interruption, as in ‘he was driven to distraction by the continuous hum from the factory next door’, or indeed ‘after 17 years of continuous service for the same organisation’.